Banberry Designs original memorial windchimes are the perfect gift to give anyone who has lost a loved one. 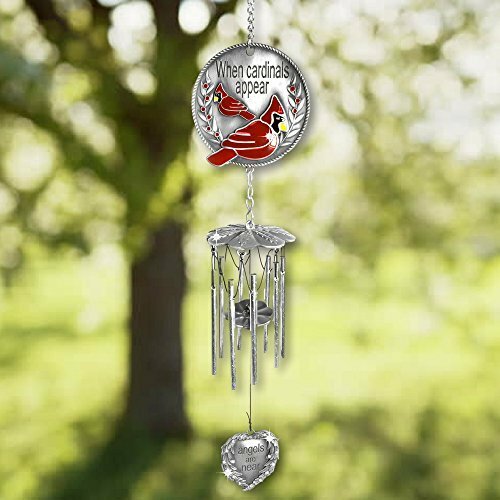 This wind chime features a red cardinal and the loving saying "When cardinals appear, angels are near". It measures approx. 15" long. It's a gift-quality pewter wind chime that is best suited for use indoors or in a protected outdoor area. Exposure to adverse weather conditions is not recommended. BANBERRY DESIGNS MEMORIAL WIND CHIME measures approx 15" long. It's a gift-quality pewter wind chime that is best suited for use indoors or in a protected outdoor area. Exposure to adverse weather conditions is not recommended. WINDCHIMES. Hanging wind catcher lovingly displays the popular "When cardinals appear angels are near" saying. These are beautiful SYMPATHY WIND CHIMES. Cardinals are very popular birds that remind us of a love one who has passed. Gift this gift to anyone who has lost a mom, dad, sister, brother, wife, husband, son, daughter, grandma or grandpa. When we hear the sound of a windchime, it helps up remember angels are always near. WHEN CARDINALS APPEAR ANGELS ARE NEAR wind chime. 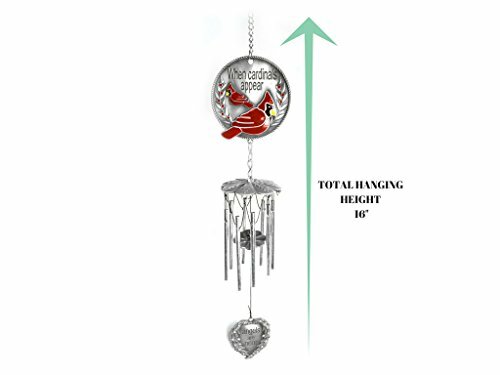 Beautifully designed windchime with red cardinal design, angel wings, and jewels. This is a thoughtful condolence gift in tribute of a loved one. CARDINAL DESIGN. The top of the windchime has an RED CARDINAL design. The charm hanging from the bottom is a heart shape with angel wings surrounding it. Decorated with clear rhinestone crystals, it is engraved angels are near. WIND CATCHER. 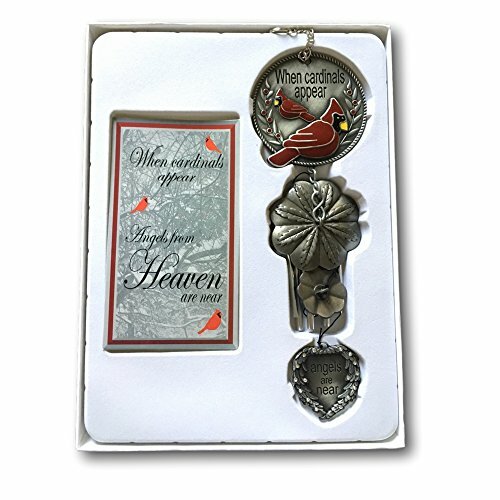 This is beautifully gift-boxed with an attractive memorial card that has cardinals and a winter scene. Perfect way to give someone a touching gift that has recently lost someone they love.